Coming Soon – 1306 Oakhurst Court, Lebanon, Ohio 45036 – Gorgeous 3 Bedroom home in Shaker Run! 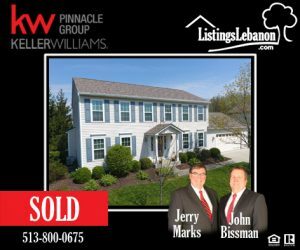 Sold Listing in Garfield Park – 254 Portland Blvd, Lebanon, Ohio 45036 – Lots of updates! This immaculate 4 bed 2.5 bath home in Garfield Park Subdivision with Finished Lower Level is move in ready! Must See! Largest floor plan in Subdivision with lots of updates and extra storage. Extended driveway pad and large covered patio with private back yard. Minutes from Lebanon Jr High. Won’t last!